The result is a blow to the Reds, particularly on the back of last week’s thrilling 4-3 victory over table toppers Man City. 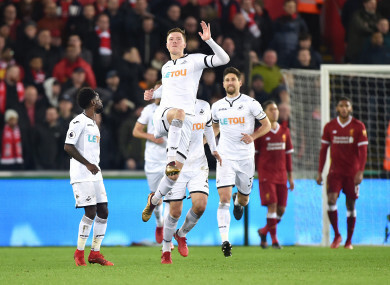 Swansea City's Alfie Mawson (centre) celebrates scoring his side's opener. LIVERPOOL’S PROGRESS TOWARDS securing a Champions League spot was halted by the Premier League’s bottom club and a single goal by Alfie Mawson on Monday as Liverpool’s defensive frailties returned. Email “Relegation-threatened Swansea hand Liverpool their first Premier League defeat since October”. Feedback on “Relegation-threatened Swansea hand Liverpool their first Premier League defeat since October”.